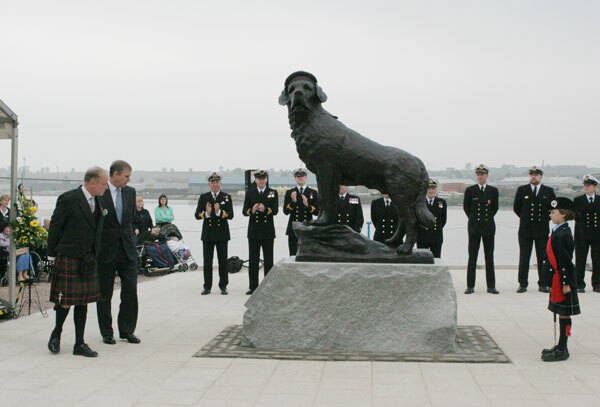 The larger than life size bronze statue of Bamse was unveiled by the Duke of York, Prince Andrew, on the 17th October 2006. Click to watch the video of the ceremony, complete with interviews and local footage. Children from the primary schools lined Wharf Street, backed by several hundred adults, with representatives of the Royal Norwegian Navy and British Navy also present. Among the many invited guests were Mr Bjorn Eilertsen, Norwegian Consul in Edinburgh, Commodore Charles Stevenson of the Royal Navy, and Vigdis Hafto, daughter of Bamse’s owner. The Prince, accompanied by Mrs Georgiana Osborne, the Lord Lieutenant of Angus, was formally introduced to Provost Bill Middleton, Bamse project managers Dr Tony Sutton, Mrs Henny King, Dr Andrew Orr, and sculptor Alan Herriot. Dr Orr then welcomed His Royal Highness and invited him to unveil the statue.